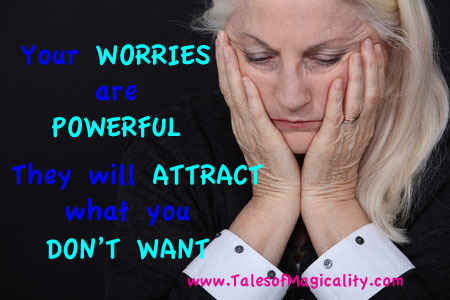 Have you ever noticed how when you worry about something happening to you, that’s usually what happens? Doesn’t that stink!? And, unfortunately, that’s usually what we notice the most—the things we didn’t want happening, happening—even though we are constantly attracting good circumstances to us all the time too. Take it from me, “the worry queen,” worry does no good! While I have been a worrier most of my life, I finally learned the hard way how powerful my worrying can affect me…physically. Getting dressed up club style, platform heels and all, for my best friend’s bachelorette party in NYC, I kept stressing about falling and breaking an ankle or something while wearing my heels; I’m not one to wear heels more than a few times a year and this was one of those occasions. I even stuffed into the pockets of my coat my flip flops, my more usual style of footwear, in case my feet were killing me and I had to change my shoes. One of the girls that was with us grabbed me by the shoulders as were getting ready to leave for the club and said, “Mar, you are not allowed to stress tonight! You are here to enjoy yourself and that is what you are going to do. Everything is going to be fine!” I thanked her for the reminder that snapped me out of my negative state and ended up having a great time dancing the night away till 5 am…without falling or tripping once. It wasn’t until we got home that my worry magnet brought my worries to life, like there was a delay in the universe’s delivery system. While stepping out onto the balcony when we got back to the apartment, with my flip flops on at that point, oddly enough, I fell on the side of my ankle and come to find out the next day, after being encouraged by my husband to go to the ER, that I fractured my ankle in 3 places; my first broken bone ever. At first I didn’t make the connection between my thoughts only hours prior to my broken ankle and its actual “breaking point,” but once it dawned on me, I realized how powerful my worrying had been in attracting exactly what I was worrying about, exactly what I DIDN’T want to happen!